Poke-O-Moonshine Mountain is located in the Taylor Pond Wild Forest. Until 2008, there was only one marked trail to the summit; a steep 1.2 mile climb from Route 9. In 2008, 200 acres were added to the Taylor Pond Wild Forest and a new trail to the summit was constructed utilizing the new land purchase. This new trail is now shown on the new Lake Placid/High Peaks map from National Geographic. This route is a 2.4 mile approach starting a little farther south on Route 9. The trail climbs 1450' from the trail head to the summit. 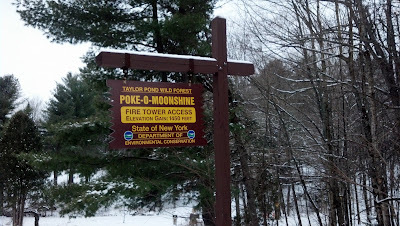 Poke-O-Moonshine is derived from Algonquin words "Pohquis" (it is broken) and "Moosie" (smooth). 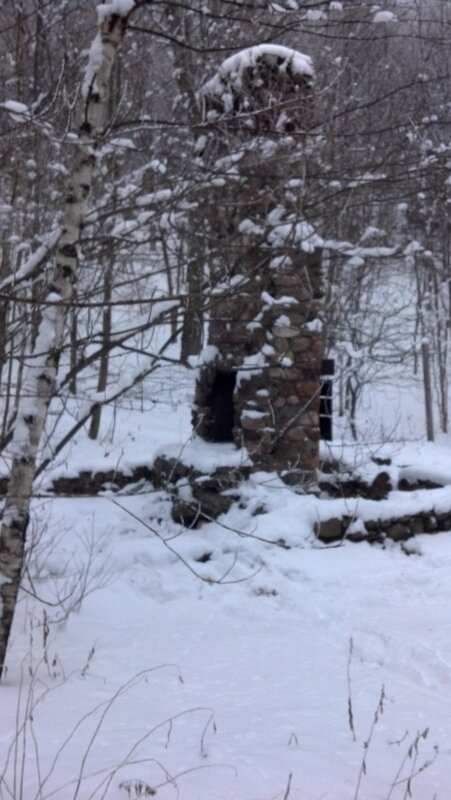 Poke-O-Moonshine has a lot to offer: a fire tower, some cliffs, the Upper Tiers lean-to. It's an all-round nice area. We didn't arrive at the trail head until 3 PM. 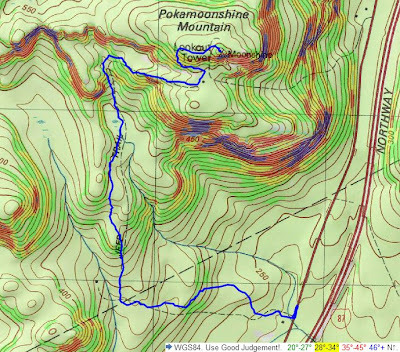 This hike was really an afterthought, since our earlier bushwhack hike in the Mt. Fay area was done at 2:30. 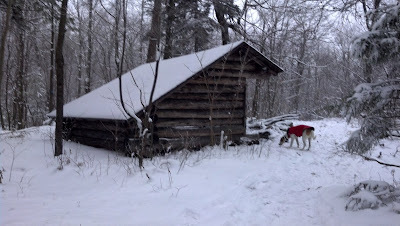 We parked and quickly headed up the trail to see how the "new" trail is. 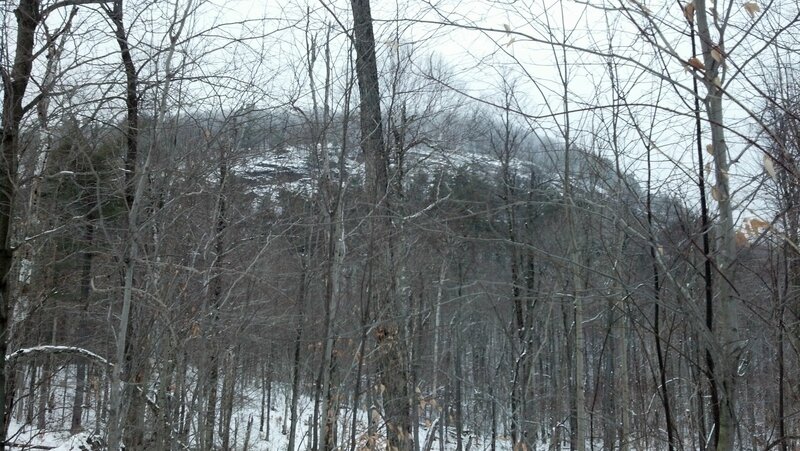 We climbed about 600' in the 1st half, leaving 840' for the 2nd half. The trail is an old truck road and is easy to walk on. 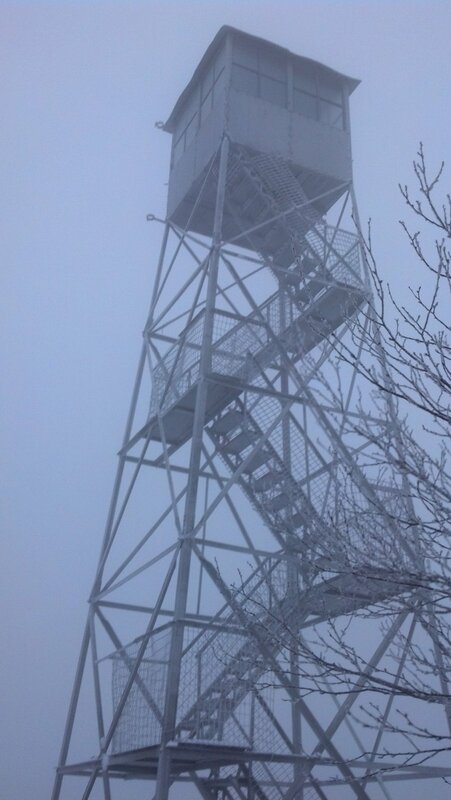 The sky was somewhat overcast, and the upper portion of the mountain was in the fog, but we enjoyed the trek up. 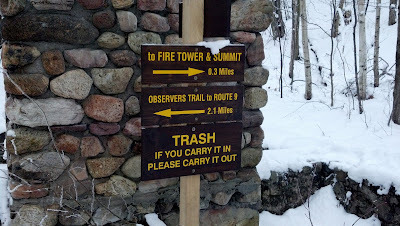 We saw three groups of hikers on their way down as we headed up. 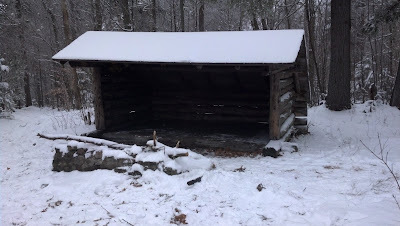 We passed the Upper Tiers lean-to; it is in fine shape. Just beyond is the chimney remains of the old fire observer's cabin. At that point, the old trail meets the new trail. I single trail leads the remaining 0.3 miles to the summit. We arrived at the summit just after 4 PM. It was quite foggy and was already beginning to feel like darkness was setting in. I climbed the fire tower steps to the underside of the cab (the cab was locked). Due to the fog, I had no view. I imagine on a clear day, there would be exceptional views. For those that don't like to climb the tower, the open rock summit should be sufficient to see most of the same views. We didn't linger since it was getting dark and visibility was nil. As we made our way down, I was noticing that the tote road would be a great trail to ski down with good snow conditions. We got back to the car at 5 PM, just as we would have needed to switch on our headlamps. I'd like to come back to this trail on a clear day to "see what there is to see", but even without the view, the hike is a great hike. working on the fire tower challenge, and thinking of grabbing this hurricane and belfry this weekend...do u recall the parking situation (I do not have 4 wheel drive)? Both were roadside pulloffs and shouldn't be a problem. The wind chill on Hurricane will be well below zero this weekend. Amazingly cold for this time of year. Have fun!